We strive to just include high quality, great products that will likely help you to discover what you need for your lifestyle. Our analysis is unbiased and comprehensive because we would like you to have all the important information – both good and bad before making your choice. Have you struggled to find a quality car seat for your infant that won’t break the bank? You know those types of car seats that promise you the world only to find that assembling it and using it is nothing short of a nightmare? Well, the Graco SnugRide 30 Click Connect Front Adjust Car Seat isn’t in that category. It is affordable car seat that has the highest commitment to quality, comfort and safety. It’s lightweight and has a click technology that provides a secure one-step attachment to all Graco Click Connect strollers so that you can create a custom travel system that fits your lifestyle. It is for parents with infants of 4 to 30lbs. If you’re also constantly on the move and can’t afford to leave your baby behind, this is your gift from the heavens since it can easily be attached to any Graco Click Connect strollers. You no longer need to worry about carrying your baby around with you because this seat is the answer to all your worries. Finally, a car seat that is ultra-lightweight. It has cute patterns and an amazing canopy. It is also quite comfortable, is easy to clean and has a great head support. The Click Connect Technology which provides a one-step, secure attachment of the infant car seat to the stroller and infant seat base. The base release is quite a task. You have to keep wiggling it so that you can pull it. The sun visor is also quite loud thus sometimes it can wake a sleeping baby. Despite these issues though, it redeems itself with the lightness and comfortability thus the few problems do not necessarily compromise the quality and efficiency of the car seat. The seat has an ultra-lightweight infant car seat which makes it easy for you to carry your baby from the car to the stroller and everywhere in between. It also has a Click Connect technology provides one-step secure attachment to all Graco Click Connect strollers thus creating a custom travel system that perfectly fits your day to day activities. The seat goes on to keep your baby cosy and safe with the convenient 5-point, front adjust harness. The Graco SnugRide 30 Click Connect Front Adjust Infant Car Seat has an ultra-lightweight design which makes it ideal for you and your lifestyle. The Graco SnugRide 30 Click Connect Front Adjust Infant Car Seat features a Click Connect Technology that provides a secure one-step attachment to all Graco Click Connect strollers. With the Graco SnugRide 30 Click Connect Front Adjust Car Seat, you are guaranteed a high-quality product that is safe and comfortable, for both you and your baby. Customers were pleased with its ultra-lightweight, usability and compactness. “I can carry it in one hand and hold my toddler’s hand, and the straps are the easiest to adjust”, said one customer. Another one said that it is amazing especially for C-section mums. The sun visor clicks loudly, and thus it startles the baby. The base is also hard to operate. Thus it is sometimes difficult to remove it from the car. Fortunately, this seat is very comfortable and light thus ensuring an easy move from one place to another. As I have mentioned, this product has issues with the sun visor and the base. Thus, if you feel that is not what you need, you can always try another product. I would recommend The Graco Nautilus for its luxurious features and its great value for moneyor the Graco Snugride 30 Lx Review. 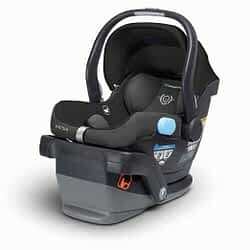 Please make sure to read our article on the Best Infant Carseat. The Graco SnugRide 30 Click Connect Front Adjust Infant Car Seat Car Seat sun visor and base release seem to be a huge problem for most customers so you can always try looking for other options that will be more suitable for you. The Graco SnugRide 30 Click Connect Front Adjust Car Seat is a great product that exceeds all the necessary safety tests. We fully recommend purchasing it as a sure way of investing in your child’s safety and comfort. At this price, which will be the least expensive it’s ever before been, you’ll spare a great deal of cash. Ensure you check out the link below for the best price.